Suddenly many people (including stranger) are giving special VIP treatment to you while doing daily activities. Suddenly, you start receiving lot'sa x'pensive gift (your wife and children included). Your will see your hem'sem face (full face ads) in major daily n.p.s next to obituary side sponsored by complete stranger & organization. It'z time to change your dull-looking home to a stunning medieval castle in middle of existing neighbourhood. Receive lot'sa horde of people (even the ex-,Ah long, sworn enemy)coming for your home daily with their smiling tooth-less smile. OPEN Invitation to join any political party with lotsa goodies provided. You will will need to buy & wear a suit plus drive Mercedes,BMW & etc. (most of the time )when eating out at warung/mamak stall to maintain image. "I scratch your back, you scratch my back" will take 360 degrees upward especially in business & politics arena if you are a "Datuk". Suddenly, your homes all full with mac'hai (volunteer) bidding to perform task for you. 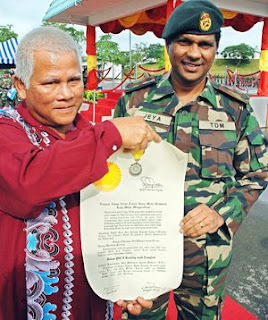 "if i am made a "datuk",i will have to dress up smartly & got a driver which i cannot afford"
At any rate, Sarawakian Kanang Langkau have proof there is no price or title worthy in this world or Malaysia for his heroic deed for the country( after being shot many times). GUA RESPECT SAMA LU! .Our politician could learn one or two things about sacrifice from him! heyz.. yelah, these people shud get recognition, but most hardly ever do. hmph. in fact, like u said, politicians shud learn a thing or two from him. ey, u notice onot? malaysia's VIP, in their formal name, got SO many pangkat kebesaran? Najib has Datuk Seri, some panglima thing, etc etc. Why ONE person so need so many salutations hor? haih.